Mearle L. Griffith worked at all levels of The United Methodist Church for more than 40 years. Under his pastoral leadership, congregations of all sizes experienced significant growth in membership, attendance, and facilities, as well as operating and endowed funds. 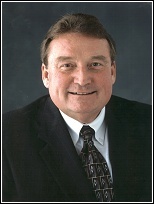 He served the Church in denomination-wide leadership as President and CEO of the United Methodist Association of Health and Welfare Ministries, Vice President of Development of the Seminary Student Scholarship Endowment of the General Board of Higher Education & Ministry, and Associate General Secretary with the General Council on Ministries. He has also been recognized for his achievements in communication ministries, marketing, and stewardship promotion while serving as Director of Communications for the Iowa Annual Conference of The United Methodist Church. He received the Herbert Manning Service Award from the University of Dubuque Theological Seminary for distinguished service to the Church and the world. Dr. Griffith has led congregations through capital campaigns for building new and expanded facilities and has provided leadership for numerous annual stewardship emphases. In addition, he was the founding Executive Director of the Iowa United Methodist Foundation and has extensive experience in fundraising in local congregations and church-related organizations. He has also chaired development committees of the boards of Rust College, Methodist Theological School in Ohio, and United Theological Seminary. Mearle has had extensive development and leadership experience with United Methodist-related children's homes and senior living organizations. He serves on the Board of Directors and Executive Committee of Asbury Communities, based in Germantown, MD, and has served on the development staff of the Florida United Methodist Children's Home. Mearle earned a Master of Divinity degree from The University of Dubuque Theological Seminary and a Doctor of Ministry degree from United Theological Seminary, and has completed additional education for development and planned giving. He was also awarded an Honorary Doctor of Ministry degree from Rust College for service to the Church and world.